4. While the Company uses reasonable efforts to include accurate and up-to-date information in the Site, the Company makes no warranties or representations as to its accuracy. The Company assumes no liability or responsibility for any errors or omissions in the content of the Site. 5. When you register with the Company and/or this Site, you expressly consent to receive any notices, announcements, agreements, disclosures, reports, documents, communications concerning new products or services, or other records or correspondence from the Company. You consent to receive notices electronically by way of transmitting the notice to you by email. 6. If you send comments or suggestions about the Site to the Company, including, but not limited to, notes, text, drawings, images, designs or computer programs, such submissions shall become, and shall remain, the sole property of the Company. No submission shall be subject to any obligation of confidence on the part of the Company. The Company shall exclusively own all rights to (including intellectual property rights thereto), and shall be entitled to unrestricted use, publication, and dissemination as to all such submissions for any purpose, commercial or otherwise without any acknowledgment or compensation to you. 7. The Company shall use commercially reasonable efforts to restrict unauthorized access to our data and files. However no system whether or not password protected can be entirely impenetrable. You acknowledge that it may be possible for an unauthorized third party to access, view, copy, modify, or distribute the data and files you store using the Site. Use of the Site is completely at your own risk. 9. NEITHER THE COMPANY NOR ANY OTHER PARTY INVOLVED IN CREATING, PRODUCING, OR MAINTAINING THE SITE AND/OR ANY CONTENT ON THE SITE SHALL BE LIABLE UNDER ANY CIRCUMSTANCES FOR ANY DIRECT, INCIDENTAL, CONSEQUENTIAL, INDIRECT, OR PUNITIVE DAMAGES ARISING OUT OF YOUR ACCESS TO OR USE OF THE SITE. WITHOUT LIMITING THE FOREGOING, ALL CONTENT ON THE SITE IS PROVIDED “AS IS” WITHOUT WARRANTY OF ANY KIND, EITHER EXPRESSED OR IMPLIED, INCLUDING, BUT NOT LIMITED TO, THE IMPLIED WARRANTIES OF MERCHANTABILITY OR FITNESS FOR A PARTICULAR PURPOSE. THE COMPANY DOES NOT WARRANT OR MAKE ANY REPRESENTATIONS REGARDING THE USE OF THE MATERIALS IN THE SITE, THE RESULTS OF THE USE OF SUCH MATERIALS, THE SUITABILITY OF SUCH MATERIALS FOR ANY USER’S NEEDS OR THE LIKELIHOOD THAT THEIR USE WILL MEET ANY USER’S EXPECTATIONS, OR THEIR CORRECTNESS, ACCURACY, RELIABILITY, OR CORRECTION. THE COMPANY LIKEWISE DOES NOT WARRANT OR MAKE ANY REPRESENTATIONS OR GUARANTEES THAT YOU WILL EARN ANY MONEY USING THE SITE OR THE COMPANY’S TECHNOLOGY OR SERVICES. YOU ACCEPT ALL RESPONSIBILITY FOR EVALUATING YOUR OWN EARNING POTENTIAL AS WELL AS EXECUTING YOUR OWN BUSINESS AND SERVICES. YOUR EARNING POTENTIAL IS ENTIRELY DEPENDENT ON YOUR OWN PRODUCTS, IDEAS, TECHNIQUES; YOUR EXECUTION OF YOUR BUSINESS PLAN; THE TIME YOU DEVOTE TO THE PROGRAM, IDEAS AND TECHNIQUES OFFERED AND UTILIZED; AS WELL AS YOUR FINANCES, YOUR KNOWLEDGE AND YOUR SKILL. SINCE THESE FACTORS DIFFER AMONG ALL INDIVIDUALS, THE COMPANY CANNOT AND DOES NOT WARRANT OR MAKE ANY REPRESENTATIONS OR GUARANTEES REGARDING YOUR SUCCESS OR INCOME LEVEL. THE COMPANY DOES NOT WARRANT THAT USE OF THE MATERIALS WILL BE UNINTERRUPTED OR ERROR FREE, THAT DEFECTS WILL BE CORRECTED, OR THAT THIS SITE, THE CONTENT, AND/OR THE MATERIALS AVAILABLE ON THIS SITE ARE FREE FROM BUGS OR VIRUSES OR OTHER HARMFUL COMPONENTS. YOU ASSUME ALL RESPONSIBILITY FOR THE COST OF ALL NECESSARY REPAIRS OR CORRECTIONS. THE COMPANY SHALL NOT BE RESPONSIBLE FOR ANY PERFORMANCE OR SERVICE PROBLEMS CAUSED BY ANY THIRD PARTY WEBSITE OR THIRD PARTY SERVICE PROVIDER. ANY SUCH PROBLEM SHALL BE GOVERNED SOLELY BY THE AGREEMENT BETWEEN YOU AND THAT PROVIDER. Please note that the applicable jurisdiction may not allow the exclusion of implied warranties. Some of the above exclusions may thus not apply to you. 11. IN NO EVENT SHALL THE COMPANY BE LIABLE FOR ANY SPECIAL, INCIDENTAL, INDIRECT, PUNITIVE, RELIANCE OR CONSEQUENTIAL DAMAGES, WHETHER FORESEEABLE OR NOT, INCLUDING, BUT NOT LIMITED TO, DAMAGE OR LOSS OF PROPERTY, EQUIPMENT, INFORMATION OR DATA, LOSS OF PROFITS, REVENUE OR GOODWILL, COST OF CAPITAL, COST OF REPLACEMENT SERVICES, OR CLAIMS FOR SERVICE INTERRUPTIONS OR TRANSMISSION PROBLEMS, OCCASIONED BY ANY DEFECT IN THE SITE, THE CONTENT, AND/OR RELATED MATERIALS, THE INABILITY TO USE SERVICES PROVIDED HEREUNDER OR ANY OTHER CAUSE WHATSOEVER WITH RESPECT THERETO, REGARDLESS OF THEORY OF LIABILITY. THIS LIMITATION WILL APPLY EVEN IF THE COMPANY HAS BEEN ADVISED OR IS AWARE OF THE POSSIBILITY OF SUCH DAMAGES. 12. You agree to indemnify and hold the Company and each of its directors, officers employees, and agents, harmless from any and all liabilities, claims, damages and expenses, including reasonable attorney’s fees, arising out of or relating to (i) your breach of this Agreement, (ii) any violation by you of law or the rights of any third party, (iii) any materials, information, works and/or other content of whatever nature or media that you post or share on or through the Site, (iv) your use of the Site or any services that the Company may provide via the Site, and (v) your conduct in connection with the Site or the services or with other users of the Site or the services. The Company reserves the right to assume the exclusive defense of any claim for which we are entitled to indemnification under this Section. In such event, you shall provide the Company with such cooperation as is reasonably requested by the Company. 14. This agreement shall be governed by and construed in accordance with the laws of the State of California, without giving effect to any principles of conflicts of law. You further submit to the exclusive jurisdiction of the state and federal courts sitting in Orange County, California. If any provision of this agreement shall be unlawful, void, or for any reason unenforceable, then that provision shall be deemed severable from this agreement and shall not affect the validity and enforceability of any remaining provisions. Want to Stay Updated on Upcoming Social Events, Webinars, Courses & Training Events? 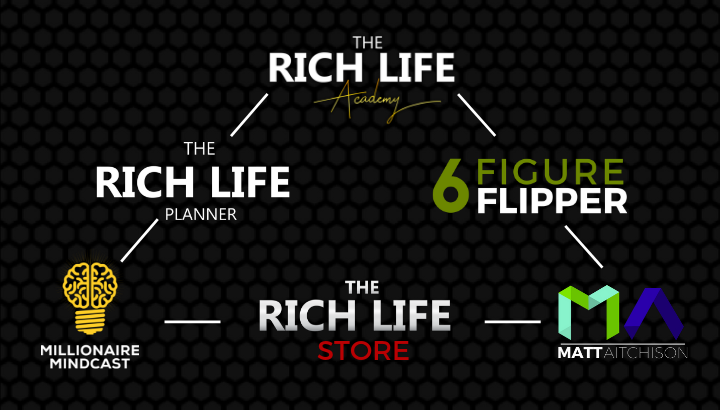 Stay Up to Date with The Rich Life Academy Newsletter. 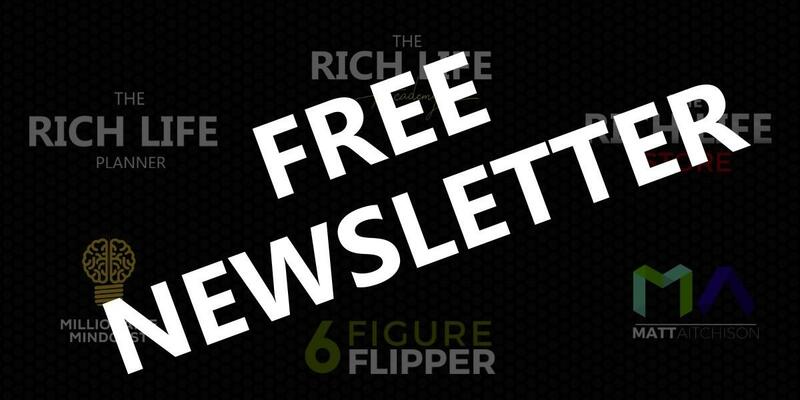 It's Free and FULL of valuable information. Don't worry, we hate Spam Too!